Severn School believes in educating the whole person in a student-centered, supportive educational community that values the dignity, self-worth, and potential of each individual. Severn's Headmaster since 2006 Doug Lagarde lives this philosophy every day. With Mr. Lagarde at the helm, Severn is a thriving, inclusive community where every member is known and valued. Whether you are a current Severn family, an alumna/us, a friend or a newcomer, we hope our site gives you a glimpse into our world and provides information that is beneficial, timely, and informative. If you are a prospective family, we hope that as you go about looking for the school that best matches your child’s strengths and interests, you will visit Severn School. The greatest gift a parent can provide a child, aside from their love and attention, is an education. It is the most durable inheritance one can pass on. The importance of choosing the right school, then, is vital and involves far more information than a website can provide. Schools are living things and while technology allows us to pass on information about our programs and people, nothing takes the place of first-hand experience. We believe that interacting with students and faculty and feeling the excitement that characterizes each Severn day is central to understanding just what is so special about our School. 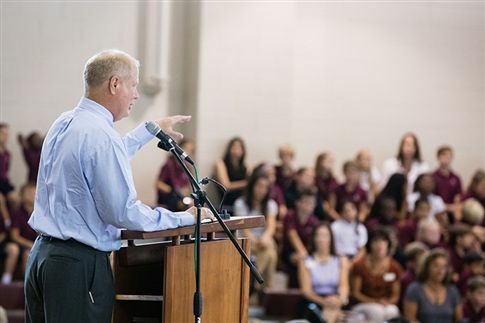 The principles of our mission – character, conduct, scholarship, leadership, service and achievement – are certainly alive and readily evident in the life of our school. I thank you for visiting Severn's website. I hope to see you on campus soon. In December 2005, Severn’s trustees enthusiastically and unanimously voted to approve the appointment of Douglas H. Lagarde as the 9th Head of School in Severn's history. He succeeded William Creeden on July 1, 2006. As Headmaster of Severn School, Anne Arundel County’s oldest independent school, Mr. Lagarde is responsible for both the day-to-day administration of the institution and the implementation of the strategic long-range plans of the school’s Board of Trustees. Mr. Lagarde is a strong advocate for independent schools. He grew up on the campus of Tower Hill School in Wilmington, Delaware, where both of his parents were on the faculty. Mr. Lagarde earned an A.B. from the College of William and Mary, and a M.Ed. from Harvard University. Mr. Lagarde began his teaching career at Landon School in Bethesda, Maryland and in 1991 moved to the University School in suburban Cleveland, OH. In his 15 years with University School, he worked in many capacities including teacher, coach, dean, assistant director of college guidance, head of the upper school and associate headmaster. Mr. Lagarde and his wife, Toby, reside on campus. Their son, Will, was the Valedictorian of the Class of 2012 and is a recent graduate of Harvard University in Cambridge, Massachusetts.